Perhaps the best way to describe yesterday’s session on immuno-oncology, is to start at the end. 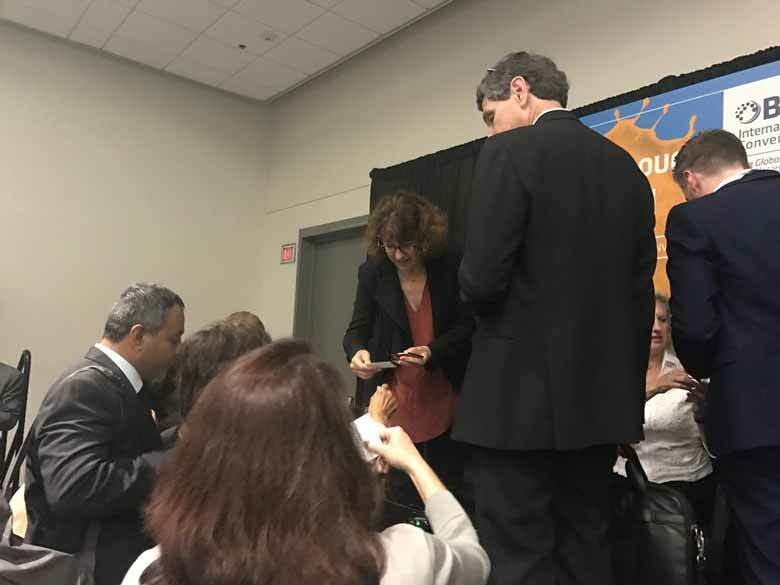 Just as the applause faded, the audience en masse rushed to the panelists, business cards in hand, hoping the brief exchange might lead to a transaction in the hottest area of biotech these days. And it could. Panelists representing some of the largest pharmaceutical companies were remarkably motivated to partner in this potentially transformative space. “This panel is really about ambition,” Dr. Bassil Dahiyat, President and CEO ofXencor and moderator, said. “The central reality is about 15 to 20 percent (of patients) have a profoundly improved outcome,” Dr. Dahiyat said. But 80 percent are left behind from this amazing advance in medicine. And that void is especially interesting to Johnson and Johnson, Pfizer, Bristol-Myers Squibb, and Amgen Inc, all represented on the panel. “Only a relatively small percentage are getting this benefit. And that’s what’s driving our strategy, is working with partners to find other agents,” said Dr. Tim Fisher, Global Lead Immuno-Oncology, Bristol-Myers Squibb. Fisher would like to see BMS break into areas where immuno-oncology hasn’t been active, such as pancreatic and prostate cancers. “We see ourselves as a friend to all PD-1, PD-L1 players. We’ve got announced partnerships with Merck and Roche,” said Bethany Mancilla, Vice President, Business Development, Amgen. It’s not unlike an arms race - with biotech, big and small, all moving toward trying to discover the next big thing. Clinical collaborations may be the engine that moves the effort forward most efficiently. “We’re trying to speed the therapy to patients and we’re doing an amazing job of breaking down barriers,” Dr. Fisher said. Big pharma is also willing to consider assets in the preclinical phase, according to panelists. “There have been some remarkable deal values for preclinical assets, some sizeable money for stuff that’s never been in a human before,” Dr. Dahiyat said. He asked the panel, how much data is enough? Dr. Fisher said BMS has executed some deals with only preclinical data but only when there has already been clinical evidence established. Dr. Dahiyat noted there have not been a lot of mergers and acquisitions in immuno-oncology. Panelists said the area is so new they prefer to develop a relationship with smaller biotechs, akin to a long courtship.